Edited by James M. Johnson, Christopher Pryslopski and Andrew Villani. Albany: State University of New York, 2013. ISBN 978-1-4384-4814-5.-695-2. Illustrations. Maps. Notes. Bibliography. Index. Pp. vii, 307. $24.95. The North River Valley, as it was known at the time of America’s War for Independence, was prized by the British Army and the American revolutionaries for its strategic and tactical attributes. A central battleground from 1776 to 1780, both sides summoned all the resources they could muster to control and retain the valley. 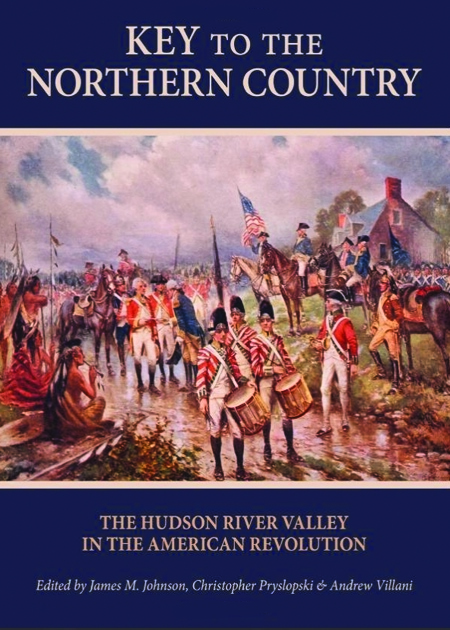 Drawn from family histories, founding documents of local governing groups and records of New York legislative bodies, the value of Key to the Northern Country, a collection of twenty essays lies in their descriptions of the region’s terrain, road and river networks, flourishing trade, variety of agricultural products, and politics played a sweeping role in the outcome of that war. The essays are grouped under four headings: Politics and Loyalties; Suffrage and Society; Fortresses, Prisons, and Huts; and Battles and Warfare. In the first group, one essay reveals why some families and individuals initially chose to remain neutral, how they were ultimately driven into the Loyalist camp, and how they suffered as a consequence. Another examines the workings of the political system—its conspiracy commissioners, extra-legal committees of safety, and committees for commodity distribution, military provisioning, and collecting money to pay for the war—that was used by the patriots before New York approved its constitution in 1777. Another focuses on the political and economic life of the counties in the Central Valley, saying the war created opportunities for new leaders, allowed the redistribution and ownership of land, and created free-hold status, each of which were revolutionary at the time. Essays in the second group examine societal conditions and movements. In Albany, the Committee of Correspondence chased away two brothers who ran a newspaper for their support of the British. Another looks at voting patterns and validates the axiom that all politics are local, even back in the 1770s. A third essay tells of the boycotts and riots that prevailed in valley villages, many of which were about social and economic issues and were instigated and dominated by women. The anthology closes with six essays about the war in the Valley. One posits that the burning of Continental frigates Montgomery and Congress on the Hudson in October 1777 by American sailors was a turning point that contributed to America’s victory in the Battle of Saratoga. Others discuss the battle of Fort Montgomery; the failed attempt to connect the Hudson River Valley to stores at Redding, Connecticut and thus prevent the British from running freely up and down the Hudson; and the value of the militia and levies as told through the eyes of a Connecticut private who performed in the New York campaign. The final essay discusses the Battle of Valcour Island on Lake Champlain–the opening salvo of the victorious Saratoga campaign and scene of the pyrrhic naval battle that destroyed nearly all of Brig. Gen. Benedict Arnold’s fleet but ultimately denied the British control of the Valley. Yet the core beauty of this book rests on its illumination of the many and varied social, cultural, economic and political actions and reactions of the people who “lived the revolution” in the Northern Country and aided it victorious conclusion. Gordon Bratz, Col., U.S. Army, Ret.